Another podcast episode complete, and this time we also recorded a full-length video! At the time of writing it is taking around 10 hours to upload due to 1) it being 1 hour long, and 2) my wifi having dropped down to tortoise-like speeds over the last couple days. In this episode Todd and I focused mainly on why protein is king among the macronutrients. We also talked about weights and cardio, reps and sets, the right amount of beer required for optimal pub game skills, and we drank some Norwegian craft beers. As we’ve mentioned before, there are three main macronutrients: Protein, Fat, and Carbohydrates. Of the three, protein is probably the most beneficial (though no diet would work without healthy doses of all three). But when you are looking to lose weight or build muscle you need lots of protein. Most people tend to wildly overestimate how much protein that they are actually consuming, with breakfast, lunch, and snacks usually containing little to no protein whatsoever. A study by Pennings et al in 2012 found that most people tended to eat almost all of their protein at dinner, so supplementing with whey protein at breakfast and lunch would be beneficial . Protein can help you lose weight by increasing satiety and thermogenesis , protecting muscle whilst dieting , and helping you to build and repair muscles after a workout through protein synthesis . To get the right amount for your body there is a simple way to work this out: Firstly work out what your body weight is in kg, then you want to get an estimate of your body fat percentage. I tend to recommend using picture comparison charts (such as the one on this website) but it really is difficult to get an accurate measurement without dissection! Anyway let’s assume that you are 100kg in weight and 25% body fat. To estimate the correct amount of protein you would first need to work out your lean body mass, this is your total body weight WITHOUT your body fat. So 100kg minus 25% body fat, which equals 75kg. This is your lean body mass (LBM). According to Helms et al (2013) the correct amount of protein for a natural bodybuilder would be anywhere between 2.1 and 3.1g per kg of LBM . As you are probably not a bodybuilder it would make sense to stay on the lower end of that, so let’s say you were to consume 2x your 75kg LBM in protein grams. This would be 150g. As you can see there are many benefits and it is clear why protein is king when it comes to both dieting and when it comes to building muscle. We actually received 3 questions from George in this podcast (my Sister’s fiance), the first of which was regarding whether high reps and low weights were preferable to low reps and heavy weights, or vice versa. This is a really good question, and the short answer is that it depends what your goals are. If you are training for hypertrophy (bigger muscles) then you can use a mix of rep ranges with weights to match. If you are training to get stronger then you would want to use low reps and heavy weights (but could throw in some back off sets using high reps too), and if you are training for fat loss, then medium to high reps with lighter weights is best. George’s second question was regarding whether you should train weights first followed by cardio, cardio first and then weights, or whether it mattered at all. Just like the first question the answer relies on what your goals are. If you are training for muscle strength or hypertrophy then my advice would be to steer clear of combining the two completely, you’ll end up getting poor results. But if you are training for fat loss (which most people are) then combining both is a great idea. Whether you train weights first or cardio is down to personal preference, but if it were me I’d do cardio last. For two reasons 1) I want to get the best results in my lifts so would always prioritise them, and 2) I don’t want to sweat all over the bench press after a hard run! If you’ve ever played pool or darts in a pub you might have noticed that something strange occurs after a couple of pints – you begin to play better! But why is this? Firstly, this does not apply to all sports – just ones that require good hand eye co-ordination, a smooth action (darts throw, pool shot, archery pull), and a slowed heart rate. In moderation alcohol can improve all of these, a study by Reilly & Scott (1993) found that having a blood alcohol content of 0.02% led to improved dart throwing, but a blood alcohol content of 0.05% led to impaired performance . Blood Alcohol Content (BAC) of 0.02% is around 1-2 pints in where you are beginning to relax, whereas 0.05% is at the 2-3 pint mark. As you can see, it doesn’t take much to go from beneficial to harmful. Remember that alcohol can affect different people in different ways, a 50kg 18 year old girl who hasn’t eaten all day is going to get drunk quicker off a pint of beer than a 120kg man who has been drinking for 30 years and just ate a roast dinner. The answer to this question is there is a sweet spot, and that for the average male that would be 1-2 pints in. Considering the delayed reaction, I would advice having a beer, ordering a second then playing (while nursing that second pint). Larger men could add a pint to this equation, while smaller men and women could remove a pint. This section is a little different today as we were reviewing a collection of Norwegian beers that were brought to us by Beer52.com a beer delivery company. They are in no way sponsoring me or anything like that BUT if you fancy giving them a go then hit up this link and you’ll get £12 off your order and I’ll get a free beer (Todd get’s nothing because it was my idea). I was insanely impressed by the beer selection from this company. I got 8 different beers from two breweries in Norway, Ægir Brewery and Amundsen Brewery. We tried four of the beers during the podcast (sharing one small can between us). 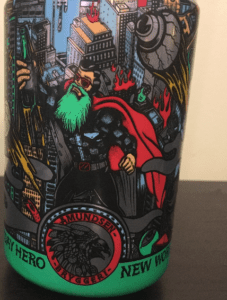 There was the Ink & Dagger IPA (6.5%) from Amundsen, the Everyday Hero IPA (4.7%), the Barefoot Grapefruit Saison (4.7%), and the Littlebro IPA (4.7%) from Ægir Brewery. Of the four my favourite was a toss up between the Ink & Dagger IPA and the Everyday Hero IPA (pictured above). They were both absolutely fantastic beers, and I would happily drink them all day. So that about wraps up this week’s episode, hopefully you now understand why protein is king, why sets and reps are determined by your goals, and why cardio after weights is best if you are looking for fat loss. In next weeks podcast we will be answering some frequently asked questions that I have heard a thousand times from many different clients (and strangers). This should be a lot of fun as some of the questions are fantastic, and some drive me crazy. Entertaining as hell! As always jump on our Instagram page, our Twitter page, and as ever our Beer N Biceps Facebook Group. P.S. If you are intrigued by the discussion about why protein is king then check out this article on everything protein that I wrote for this blog.